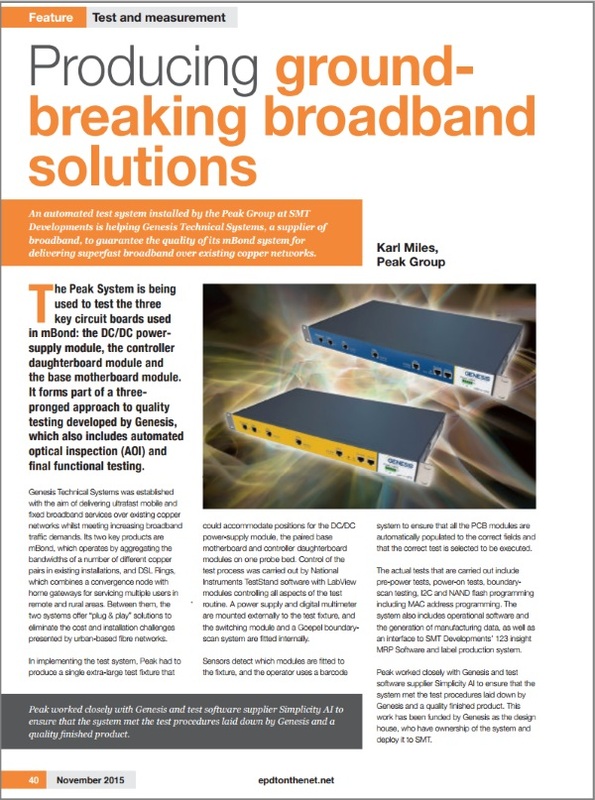 An article in EPDT (Electronic Product Design & Test) describes how an automated manufacturing test solution for superfast broadband, which utilizes software from Simplicity AI has been deployed. The test solution ensures manufactured products meet the required quality standards and customer requirements prior to being shipped. Simplicity AI’s test engineering experts worked with technology partner Peak Group to ensure successful delivery of the project. By utilizing the Tequra Framework development platform, on-top of LabVIEW and TestStand, Simplicity AI were able to rapidly develop and deploy a software solution. Our successful partner relationship with Peak Group, combined with our streamlined test software processes and development platform, helped to ensure successful delivery of this automated test solution.